Late last month the US Air Force’s (USAF) secretive X-37 space plane returned to Earth after a record-setting 718 days in orbit. With less than a month having past, the USAF has announced that the craft will be re-launched aboard a SpaceX Falcon 9 rocket in August. 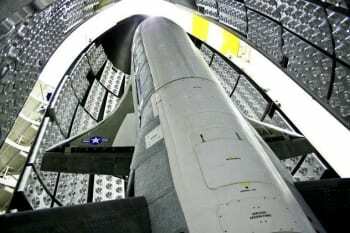 While it’s unknown what the full payload of the X-37’s fifth flight will be (the military tends to be tight-lipped on that subject), the USAF has stated that the upcoming launch will ferry an Advanced Structurally Embedded Thermal Spreader (ASETS) experiment. Named ASETS-11, the experiment will “test experimental electronics and oscillating heat pipes in the long duration space environment,” according to an Air Force spokesperson. Although the cargo being carried by the X-37 never fails to pique the interest of the aerospace community, another more seismic shift might be the highlight of the upcoming Falcon 9 launch. Since the X-37’s first launch on April 7, 2006, the craft has been lofted into orbit aboard a United Launch Alliance’s Atlas V rocket. However, the USAF’s selection of SpaceX’s Falcon 9 vehicle suggests that the rocketry start-up is gaining government confidence. SpaceX has been demonstrating a rapid acceleration in its technological abilities: successfully delivering payloads to the ISS, to low-Earth orbit and, most astonishingly, creating a functional, reusable rocket program. What’s more, SpaceX has dramatically reduced the price for entering space. Whether the Falcon 9 will continue to be the vehicle of choice for the X-37 is still anyone’s guess. However, SpaceX is making a good case for the continued use of its rockets. Given the fact that there’s probably some sort of heavily classified confidentiality agreement that comes with launching such a secretive ship, it’s my opinion that this is new contract represents a sizable shift in the rocket industry. To learn more about what SpaceX is launching, check out this article on NASA's Roll Out Solar Array.